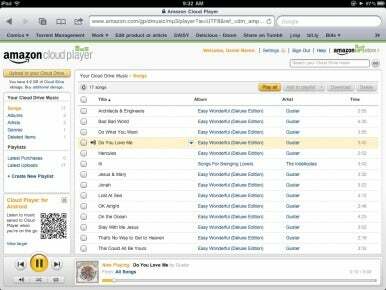 A mere two months after its release, Amazon’s Cloud Player online music player has finally added what you might call grudging compatibility with iOS devices. However, that support doesn’t come in the form of a native app, as many users had hoped, but rather as a silent update to the service’s Web interface. Previously, using Cloud Player on iOS required a little know-how—specifically, the use of a third-party browser. But Amazon has now enabled compatibility for the mobile version of Safari as well. Unfortunately, Cloud Player’s interface isn’t terribly friendly towards mobile devices; it uses the same layout that you get on your Mac or PC, which ends up requiring a lot of panning around on the iPhone. Amazon even tacitly acknowledges that the experience may be sub-par, saying it recommends accessing Cloud Player via the latest version of Internet Explorer, Firefox, Chrome, or Safari “from your computer.” In particular, I noticed that the volume control on the player didn’t work, though you can easily adjust the level on your device itself. Still, if you’ve uploaded some tunes to the 5GB of free storage that Amazon provides with its Cloud Drive service (or paid for one of the higher capacity plans), you’ll be pleased to know you can actually play back songs via Safari on your iPad, iPhone, or iPod touch. And, if you’re running iOS 4, Safari will even continue playing that music in the background when you switch out of the app. It’s not quite the same level of convenience that Amazon’s Android Cloud Player app offers, but it at least makes the service usable on iOS.